Each item has a two week (14-day) loan period. Items may be renewed a maximum of three times if no one has placed a hold on the item. New books may be renewed only once. A maximum number of books, audiobooks (CDs), magazines, music CDs that can be checked out per card is 75. A maximum number requests (holds) is 20 for all materials except DVDs. Each DVD has a one week (seven-day) loan period. Items may be renewed three times. There is a limit of five DVDs that may be checked out on a card at any time. Maximum number of DVD requests is 10. View the downloadable media page. 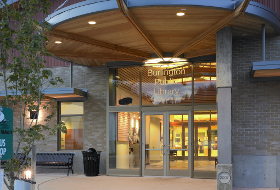 The Burlington Public Library will actively pursue the return of library materials and payment of fines and fees, including the collection agency fees. 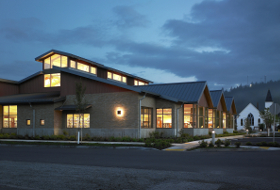 The Library Director is authorized to establish and enforce reasonable limits and fees as part of the annual budget and will inform the Board of Trustees of changes. After a period of seven years, uncollected fines and fees may be officially written off as bad debt in a vote by the Library Board of Trustees. Fine records will then be permanently purged from the system. 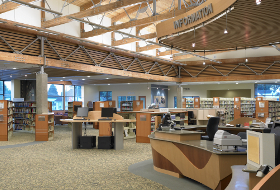 In order to provide a reasonable level of protection for library materials, and to insure that they are available for use by all patrons, the Burlington Public Library will assess replacement fee for lost or damaged library materials. The library will send pre-overdue email notices, and may call or send letters to patron accounts that are overdue. Patrons are responsible for managing their own accounts. Failure to receive a notice or bill does not exempt the patron from charges. Items not returned within 60 days of the due date will assume to be lost, and a bill for replacement will be sent to the patron. The replacement charge for lost or damaged Interlibrary Loans will be determined by the lending library. When an item is returned damaged, a fee may be assessed to repair the item. When an items is damaged to an extent that it is unusable, a fee for replacement will be assessed. If a patron pays the replacement cost for a damaged item, the patron may keep the damaged item. Once a patron’s library card is blocked, all circulation privileges for that patron are suspended, including borrowing and renewal of items and access to electronic library resources. 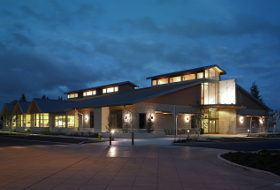 A library record becomes blocked when the total amount of unpaid fees equals $25 or more. Blocked accounts owing more than $100 for an individual, or more than $100 collectively for a family, will block borrowing privileges to all family members residing in the same household. Once a patron account has been referred to the collection agency, all fines and fees must be paid in full before borrowing privileges can be restored, unless a payment plan has been negotiated with the Circulation Supervisor. During the time the payment plan is in effect, the library will arrange for the collection agency to suspend collection activity. At the discretion of the Circulation Supervisor, limited service may be restored during the time a payment plan is in effect. Failure to fulfill the terms of the payment plan will result in the account again becoming active with the collection agency and limited service, if any, being blocked. If the patron has not yet resolved the outstanding balance after 120 days, the customer’s account will be reported to all three of the major national consumer reporting agencies: TransUnion, Equifax and Experian. If a patron has paid for a lost item, and later finds the item, the patron may request a refund of the payment provided the item is in good condition when it is returned to the library, and the item is returned within 30 days of payment date. Refund requests are processed promptly and mailed to the patron within four weeks.